Looking forward to seeing you at 4pm for the Cadet Halloween party. Anyone who wishes to come but hasn’t managed to get a ticket yet, please let me know. Just a note that the kitchen will NOT be open this evening for food and we are only providing some crisps and sweets, so you may want to feed your little ones before you come. Prize giving is nearly upon us, more details to follow about meal and tickets by the weekend. However to have a prizegiving, we need some prizes, so it’s time to bring back them back so we can get them engraved, By my reckoning, the people listed below may well have something to return, so please bring them back at your earliest convenience. here’s the SI’s for the Winter, just in case we get a sail this weekend. Hi all! It’s that time of year again when I dust off my broomstick and create some magical Halloween fun for the cadets! This year we will be celebrating on Sunday 29th October, 4-6pm. Tickets will be on sale from tomorrow evening, 19th October, from behind the bar priced at a bargain £3.50 each! Your ticket includes the usual crazy disco and games fun with DJ Groovy Tunes, plus some naughty sweets and crisps to nibble on. Now the boring small print…… this event is open to MEMBERS ONLY. Please do not cause embarrassment by asking for tickets on behalf of non-members – cadet names will be required for all tickets sold. It is not possible to reserve tickets – payment is required up front. Standard Yellow Dart 16: Number 2431. A lively group of Cadets competed in the 7th Annual Matt Dear Trophy held at TEYC. The heavy winds and particularly the gusts were going to make the day difficult. However, 13 eager Cadets faced the challenge and managed a good start. Luke and Sam in the RS Feva claimed clear wind and were in second place on the line. They continued to sail well throughout the race, despite Luke being swept out the boat and managing to skillfully climb back aboard! 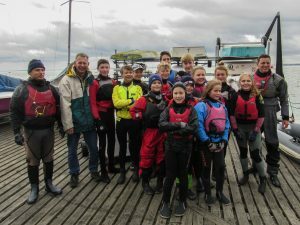 Our sailors aged from 10 to 15 years old, tackled the rolling waves and with a few token capsizes completed the 3 laps of the course. 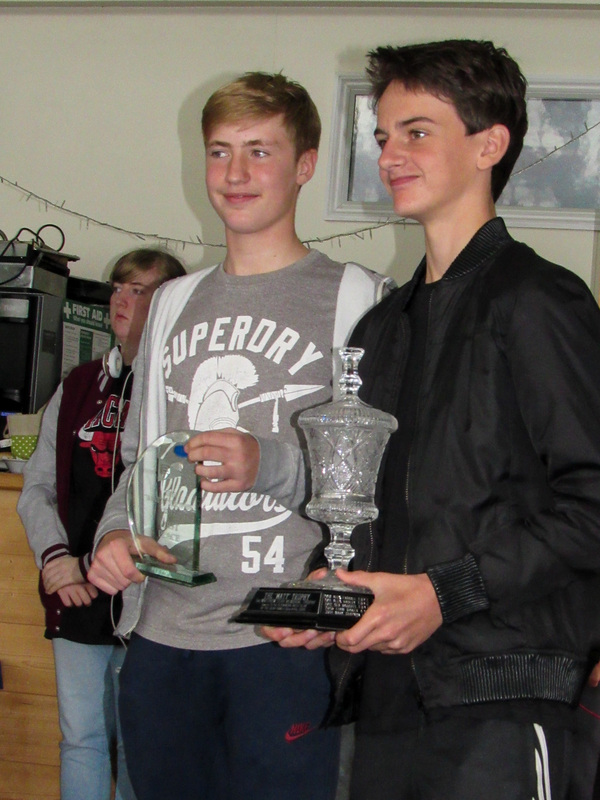 Luke and Sam, won on handicap becoming The Matt Dear Trophy Champions. We are again very proud of our TBYC Cadets for their participation and sterling effort, whilst also representing our club. 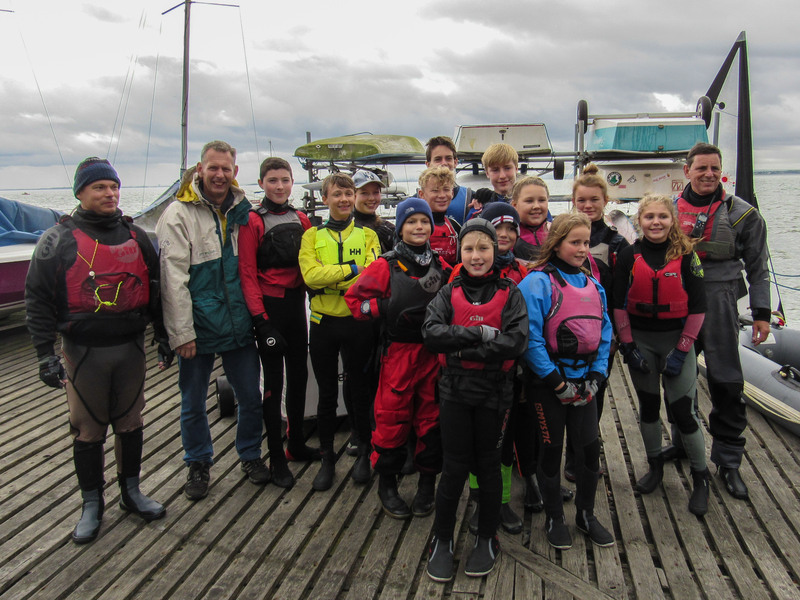 Thank you to Ian and Sue Simpson at TBYC for organising and hosting the event. This annual charity race was first held in 2010 in memory of Matthew Dear, who tragically passed away in 2009. The aim of the charity is to raise awareness of the dangers of anabolic steroids and appearance and performance enhancing drugs. See www.matthewdearfoundation.co.uk for more information. Saturday 9th December – Now is the time to get your friends together for the party of the season. More details to follow – tickets go on sale soon, watch this space. from Phil Crawford to all those involved on Saturday pm. To the RIB crew for getting me ashore, and helping Margaret pack the boat away, to Chris and Ivan for “walking” me through the boat park, to Howard, Gary and Lindsay for support roles and to Jack and colleague in their “professional paramedic” roles. I should be OK next year, once I’ve had a pacemaker fitted! This weekend is the last sailing weekend of Autumn with 2 races on Saturday and culminating in the End of Season Trophy on Sunday. Please remember it’s the end of season Trophy this Sunday and if you’re not entered for the Winter Series or paid winter storage you need to take your boat home. even if you paid winter storage, if your boat is in the area where the Sandhoppers or Cruisers live over the winter you will need to move your boats out of the way.